Akismet by Automattic is a anti-spam service which protects blogs, forums and websites from comment, pingback and trackback spams. It shipped with each and every WordPress installation by default as a plugin, and has been the major contributor in reducing web spams. Unfortunately, officially Akismet is only free for personal weblogs which no ads placement. If you have even one ad block or affiliate link on the website to have some income revenue, you must subscribe to Akismet paid account plan, which starts from not-so-cheap $5 per month for Pro single-site access. If you’re not interested to pay Akismet for something that is not your fault (who wants to attract spams to own sites? ), AntiSpam Bee is probably the best and ultimate alternative to Akismet to reduce spams on WordPress publishing platform. AntiSpamBee is developer by a German to make a easy yet effective anti-spam plugin for WordPress, while provide free anti-spam solution without the need compromise privacy as all anti-spam algorithm and procedure is taking place locally. Most of the spam is the work of spambot, which is script used to crawl the web and insert spam comments, pingbacks or trackbacks automatically whenever possible. AntiSpam Bee tries to eliminate spams caused by spam bots totally by using two methods. AntiSpam Bee modifies the comment box (a textarea) field name with a unique name based on first 8 characters of MD5 hash checksum of the URL. In addition, a new comment text area which set to “display:none” style so that it’s invisible and hidden from view of human user is added. On submission of comments, AntiSpam Bee checks if the “wp-comments-post.php” is being requested properly, if the submission method used is “POST”, if the $_POST variable isn’t empty, and whether the additional hidden comment box text area has been filled up. When the additional hidden field is filled blindly (which is the case for most spambots), it means that the comments are been submitted by spam bots, and thus is marked as spam or deleted automatically. Other than comments, AntiSpam Bee also verifies all incoming pingbacks and trackbacks for validity, based on concept presented by Simple Trackback Validation plugin. It checks if the IP address of the pingback or trackback requester or sender is equal to the IP address of the web server of which the pingback or trackback URL is referring to. The validation is effective because most spam is sent by third-party machine where automated script runs instead of website. 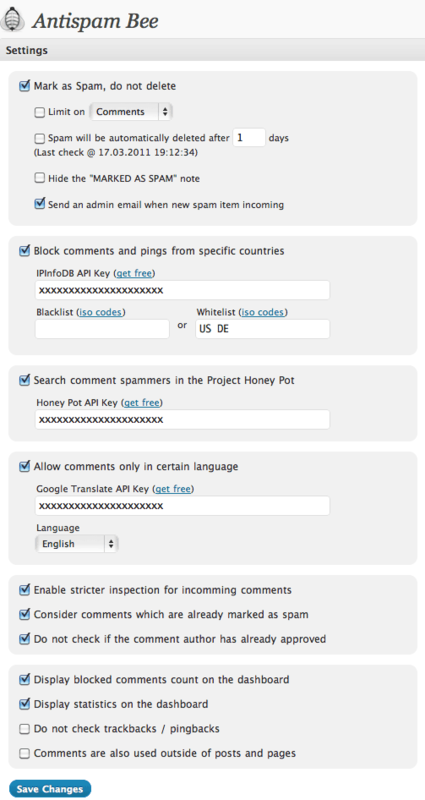 To provide more protection against human spammers, AntiSpamBee allows comments to be compared with known spam comments in the Project Honey Pot database. Project Honey Pot is a public database that tracks and lists IP addresses of Internet robots and the spammers. Webmasters and publishers can also set to accept comments in certain language to block spam comments in foreign languages. Another effective to prevent human spammers is by configure AntiSpam-Bee to consider comments which are already marked as spam, where AntiSpam-Bee will compare the IP address of new comment against IP addresses of comments already marked as spam in the database. A match will deem the new comment as spam too. Or, enable stricter inspection for comments where available network information such as host name or truncated IP address is also compared. However, do note that the IP address or network information comparison may cause false negatives as genuine and spam commenters may share same network name or IP address due to usage of VPN or proxy server. Overall, with the implementation of AntiSpam Bee on My Digital Life, almost 99% of spams are blocked and prevented automatically. The only downside of AntiSpam Bee is that, unlike Akismet, it has no ‘learning’ capability. In other words, when you manually mark a comment, pingback or trackback as spam, AntiSpam Bee won’t take that into consideration, and you will likely to see more similar spams to appear. Fortunately, AntiSpam Bee can be used together with other evaluative anti-spam solution such as Akismet, Typepad AntiSpam and Defensio to catch any false positives or slip-through spam comments, pings and trackbacks. Manual for AntiSpam Bee (in German) at author’s blog.